Designing an effective schedule is an art that relies on science. It is a common misconception that one can simply invent a daily schedule of several short sleeps and feel rested and happy on it. Instead, such attempts will usually lead to nothing more than weeks of incapacitating sleep deprivation and, eventually, capitulation and a return to the prior norm. For two decades now, experimenters have been playing with theory and validating with trial and error, in order to save you months and years of wasted efforts. In this document we wish to publish our current findings and best practices to make polyphasic sleep feasible and rewarding, based both on published research evidence, as well as experiments conducted by the polyphasic community. Light sleep only maintains wakefulness for a certain length of time. We find it takes about 5 sleep cycles containing half light sleep to stay awake and alert for the entire day. Occasionally, some people need 4 or 6 cycles due to genetic variation, diet, stress, exercise, sleep quality, or environmental factors. Unlike in polyphasic sleep, sleep repartitioning does not happen much in one daily shortened sleep session. With shortened mono, a 5 or 6 hour core cannot overlap both SWS and REM pressure peaks (21:00-midnight and 06:00-09:00 respectively). This inefficiency contributes to the lack of repartitioning, resulting in REM and/or SWS sleep deprivation. The first sleep cycle in a sleep block typically has a higher percentage of SWS or REM than following cycles. Following cycles within a continuous block contain progressively more light sleep. 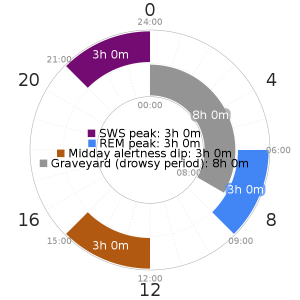 This dynamic contrasts with polyphasic sleep, which has multiple “first cycles” that are each more REM or SWS efficient. With the failure to repartition, sleep deprivation on shortened mono causes the amounts of REM or SWS to rebound in the following night’s sleep. Since this primarily affects the first 20m of a sleep in the form of SOREM or SOSWS, it is often insufficient to correct a previous day’s imbalance. Sleep deprivation therefore continues. When shortening monophasic sleep the duration that one is awake increases compared to the length that regular monophasic sleep functions with. We strongly recommend only attempting schedules with a safe amount of sleep for your age. Ironically, many younger people do not feel sleep deprived when reducing sleep below safe levels. Long-term consequences to development are still a risk regardless of how you feel4–7. See Lifestyle Considerations for more detail and supporting evidence for the importance of higher sleep totals while the brain and body are developing. Minimum polyphasic requirements are estimates based on community experience and do not constitute medical advice, as sleep need varies amongst people and circumstances. If a desired schedule pattern fits your schedule, but is below your threshold, you may add 90 minutes to the core in order to ensure your wellbeing. In the case of Siesta-extended, use a 6 hour core with your 90 minute siesta. The maximum wake time per day that 99% of people may achieve is 20 hours. See Sleep Mechanics for why this is. That said, polyphasic scheduling is an experimental art and science designed to increase quality wake time without sacrificing wellbeing. The essential strategy is increasing the frequency of sleep. The first mechanism by which this works: light sleep’s ability to sustain wakefulness has diminishing returns. This means the more light sleep you get, the less helpful it is at keeping you awake longer. On reduced-sleep polyphasic schedules, a nap of 15-25 minutes can keep you fresh for 4-8 hours (possibly for a shorter time during adaptation), depending on the length of supporting core(s) and time of day. On Everyman 1, a single nap might keep you alert up to maximum 11 hours until your bedtime. On Dual Core 1, a single nap might keep you going for 9 hours maximum. With monophasic sleep, it takes 4+ hours of light sleep to sustain wakefulness for an entire day. Even then, there is a well known circadian dip9 in alertness around 12:00-15:0010–12. Maximize alertness by sleeping when drowsiness is most likely, e.g. the SWS peak for some (21:00-midnight), the “graveyard” hours for most (midnight-08:00), and the midday slump for most (by 15:00). Minimize sleep inertia (no SWS wakes, avoid REM wakes). 90 minute cycles, or 20 minute naps. Separate sleeps by at minimum 2-3 hours and usually more, depending on the schedule. See Lifestyle Considerations for adjusting sleep schedules for age, exercise, work, diet, and other factors. The length of each sleep session is specific because sleep happens in cycles. In general, a sleep cycle is about 90 minutes, but sometimes as long as 120 minutes or short as 80 minutes depending on many factors including person-to-person differences14. Cycle lengths also vary on a daily basis. See Sleep Mechanics for more information regarding sleep architecture. Adaptation to polyphasic sleep involves fitting more SWS and REM into less time, by reducing total light sleep. This is observed both by increasing the percentage of SWS and REM within each cycle, and often by reducing the duration of each cycle. Cycle lengths have been observed to become as short as 80, down to about 60 minutes in extreme cases with frequent sleeps. Right at the beginning of a new cycle during the light sleep stage. Core sleeps scheduled in 90 minute cycles are generally safe lengths to enjoy these easier wake points on polyphasic sleep. These will both minimize or prevent sleep inertia, ensuring maximum alertness and productivity. Generally, the light sleep after a SWS block will still be a bit more difficult/unpleasant to wake from than light sleep after REM. Polyphasic sleep takes advantage of the aforementioned two ideal wake times by distinguishing cores vs. naps. Cores are typically a multiple of 90 minutes on a polyphasic schedule. After multiple weeks, many polysleepers find themselves waking up earlier than expected for 90 minute cycles, and can safely reset their alarms to reflect shorter sleep cycles. Other schedules like Dual Core 1 can lengthen sleep cycles of cores. Core placement matters because most schedules rely on cores exclusively for SWS sleep. Core length till alarm matters because you definitely want to wake in light sleep every time. Waking in an SWS block strongly risks falling back asleep, or not waking at all. Waking during REM is ok, or may be desirable for dream recall, but does carry more sleep inertia. Waking comfortably during light sleep won’t happen consistently during the adaptation process, but by definition it will once adapted after about 4-6 weeks. Core number matters because the more separate cores you have, the more opportunity you have to place each core at an ideal point for circadian peaks and reset the homeostatic sleep pressure (see Biological Rhythms for more information about these two processes). A core placed overlapping 21:00 to midnight will enjoy maximum amount of SWS, and a core placed overlapping 06:00-9:00 will enjoy maximum amount of REM. That is if your light exposure and activity are aligned more or less with sunlight. People often disturb or alter their circadian rhythm with artificial light or excessive adrenaline/stress, altering when these peaks occur, often causing them to occur later than they otherwise would. See Lifestyle Considerations for more information. Core cycle length matters as you progress in adaptation. Start with 90m cycles as the default. After some weeks, if you consistently begin waking early then you can assume that your sleep cycles are naturally becoming shorter. Many polyphasic schedules have this effect (which appears to increase with shorter sleep times), and you can eventually set your alarms earlier to reflect the shortened sleep cycles. One can also increase core lengths by 30 minutes after the 2nd or 3rd cycle of the night. This will increase the ease of adaptation as well as allow for greater day-to-day flexibility of sleep times (only) after adaptation is complete. The downside is, of course, a bit more time asleep. Naps should be 20 minutes long. You can set alarms for about 22 minutes to account for time to fall asleep. Naps longer than 25 minutes have an increased chance of reaching the SWS stage during which waking up becomes harder and most people wake up groggy. During adaptation, SWS is prone to creeping in earlier, too, making 20 minutes the safest productive length. Some advanced schedules do use 30 minute nap times, usually in an attempt to gain some SWS despite very little core time. These are much harder to adapt to, and are not recommended for beginners. Naps can be less than 20 minutes. If necessary, you could schedule two 15 minute naps instead of one 20 minute nap. This is less efficient because up to 5 minutes at the beginning of each nap is usually light sleep. During and after adaptation, however, naps often naturally decrease in length. Waking naturally after 15 to 18 minutes is totally normal. Some people wake naturally often around 8-12 minutes, but that generally does not sustain enough wakefulness and they should return to sleep until their alarm to increase the chance of sufficient REM. Naps should be at least 3 or 4 hours, or 2 sleep cycle lengths apart. This ensures enough homeostatic pressure for quality naps, as well as ensuring the brain treats each nap as separate. Without separation, SOREM may not occur in later naps, and instead you may fall quickly into deep (SWS) sleep without the 25m sleep-initiation buffer. For more explanation, see Sleep Mechanics. On most schedules, naps and sleeps are closer together in the AM / morning through midday hours, and can expand further apart in the evening without loss of wakefulness. This is usually done to take advantage of higher chance of REM occuring during the circadian morning. Occasionally, naps on extreme schedules will be placed at exact intervals to take advantage of subtle wakefulness rhythms, the BRAC cycles. Adaptation to napping has occurred when most or all of your naps take advantage of Sleep Onset REM (SOREM). This is an emergency REM-preservation feature of the brain witnessed most clearly in narcoleptic patients, but can be triggered by healthy individuals in reduced sleep polyphasic schedules. After just a couple or few minutes of light sleep required to transition from waking, you will fall into REM sleep for up to about 15 minutes. Until later in the adaptation process, naps will only consist of light sleep – which will be mildly refreshing, but REM pressure will steadily build and you will feel sleep deprived when the light sleep wakefulness fades. Monophasic is sleeping in only 1 sleep block, e.g. midnight to 07:30. Biphasic is any sleep schedule with any 2 sleep blocks. Segmented has two long cores separated by a “core gap” of at least 2-3 hours. Siesta has a long core at night and a single-cycle core in the day. Everyman 1 (E1) has a long core at night and a 20m nap in the day, which qualifies it as both biphasic and Everyman. Biphasic is a category of convenience: These are the only standard schedules we recommend for under 18 years of age. They are also the three easiest polyphasic schedules with historical (>500 references to segmented sleep15), cultural (siesta countries), and anecdotal (E1) evidence around the world. First time polyphasers are discouraged from attempting anything except Easy or Moderate schedules, since there are many new skills and habits to develop (It can only take one thing going wrong to oversleep and fail or delay an adaptation). Regardless, E3 remains the most popular of the harder schedules. Occasionally, first time attempts at Everyman 3 result in success. Successful attempts at other challenging schedules are fairly rare. There are several things to consider when you are trying to determine whether a given sleep schedule is right for you. Are you under 18 years old? Risks are less known and more serious for reducing total sleep. If so, proceed to Lifestyle Considerations. Do you do or wish to do intense exercise or physical labor multiple days a week? You should plan for a minimum of 3 SWS-containing core cycles per day; e.g. Everyman 2, E3-extended, DC1 with first core extended to three cycles, Triphasic-extended with two cycles (3h) in dusk/night core. Then, investigate your lifestyle. When can you reliably sleep and nap every day? To do a non-biphasic schedule, you must not have greater than an 8 hour period where you cannot nap every day (schedules with lower sleep totals, like E3, require even smaller gaps). It is much better to be busy past noon rather than before noon, since daytime sleeps require sufficient REM pressure (prevalent in the morning). It is also easier to stay awake longer in the late afternoon through night on polyphasic schedules. If times seem scarce, get creative with planning sleeps in quiet rooms, a car, or at your desk with a sleeping mask and earphones with white/pink/brown noise. Do you naturally wake up in the early morning hours, and are then easily able to stay awake for one or more hours, before falling back asleep? You might have felt that something is wrong with you, or that it’s a problem. Sometimes it is a symptom of an underlying disease or deficiency, and it’s worth seeing a doctor. If not, you may be naturally suited to a documented ancestral form of sleep we call Segmented, which is a type of Biphasic sleep15. If you’re tired because of this, you’re probably not going to bed early enough and/or waking up late enough to allow enough time for your waking period between sleep blocks. Segmented can also be complemented with naps as in the Dual Core line, or the cores can be further split resulting in the Tri Core line. If you wake frequently but don’t necessarily stay awake easily, you still might benefit from intentionally short cores of only one or two cycles each. Each sleep interruption in a long block decreases sleep quality, whereas spreading short cores throughout the day can increase quality by using circadian and homeostatic pressure. Now that you have a sense of when you can and should sleep, explore the various schedules the community has developed over the decades. 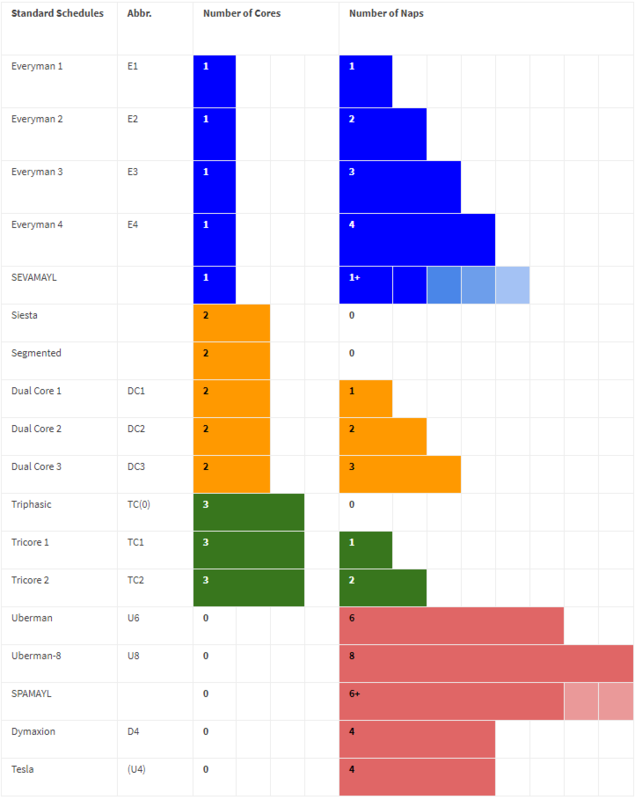 If you’re a beginner, look at easier or moderate schedules like Everyman 1 (E1), Siesta, and Segmented under Biphasic, or E2, Dual Core 1, and extended E3. Avoid rotating or modifying them far from the the standard recommendations that have been developed and proven over the years. Keep in mind that the scheduling boundaries provided later in this guide refer to strict placement of permanent sleep blocks, and should not be confused with flexing the sleep times. For more information on how strict each sleep block should be, see the “Managing sleep deprivation” section. It is highly recommended not to only use your own insights when designing a schedule. It is very easy to miss some important details. Once you’ve studied this it is recommended that you ask an experienced polyphasic sleeper to examine and verify your schedule. Post on the /r/polyphasic Subreddit or in the Discord chat server. Complicated cases should work with users interactively on the Discord to see what uncommon modifications might be possible or necessary. Durmer JS, Dinges DF. Neurocognitive consequences of sleep deprivation. Seminars in neurology. 2005;25(1):117-129. https://depressiongenetics.med.upenn.edu/uep/assets/user-content/documents/DurmerandDinges–NeurocognitiveConsequences–SEM.NEUROL.2005.pdf. Teens and Sleep. National Sleep Foundation. https://www.sleepfoundation.org/sleep-topics/teens-and-sleep. Published 2018. Accessed December 9, 2018. Barnes CM. The Ideal Work Schedule, as Determined by Circadian Rhythms. Harvard Business Review. https://hbr.org/2015/01/the-ideal-work-schedule-as-determined-by-circadian-rhythms. Published January 28, 2015. Accessed December 9, 2018. Smith D. Scientists Discover How Gene Mutation Reduces the Need for Sleep. UC San Francisco. https://www.ucsf.edu/news/2018/03/410051/scientists-discover-how-gene-mutation-reduces-need-sleep. Published April 16, 2018. Accessed December 9, 2018. Ekirch AR. At Day’s Close: Night in Times Past. WW Norton & Company; 2006.